In-house rule sets and much more (well a little bit more) …..
Over the last few years we’ve slowly (very) been working on tidying up our various in-house rule sets. It started as a project to update them for ourselves but we also decided that if they tarted up ok we’d eventually make them all available to other gamers free (ie a donation if you feel like it). Recently while working with Empress on a Modern Battlegroup set (Oscar Mike) and totally unplanned, we snaked our way back to first principles gaming (ie no dice or tables games). The result was we ended up revising our core play combat systems. Very much for the better as it turns out as it’s really given our gaming and hobby a new impetus. Sooooo what are we working on …..? Fire Team and Oscar Mike. Fire Team is our own set of 8-20 man modern skirmish rules with a dose of RPG elements thrown in (that’s Role Playing Game not Rocket Propelled Grenade!). It was basically finished and had been pretty well tested but is now being re-vamped with our new combat system which greatly simplifies things but still allows for detail where it’s wanted. That and the lure of making a “Syrian-Modern” style destroyed city terrain board has generated some excitement again. World at War (working title lol) is a Platoon-Company sized WW2 game. Originally just set in Western Europe we’ve been using and tweaking our WW2 rules for over 30years of gameplay. Oddly this was our rule set we were most happy with as it always matched up to the thousands of books and combat accounts digested. However the new combat system plays so well that even this has gotten a re-write to use that as it’s core. The equipment lists are currently being expanded to cover most of the middle to late war. 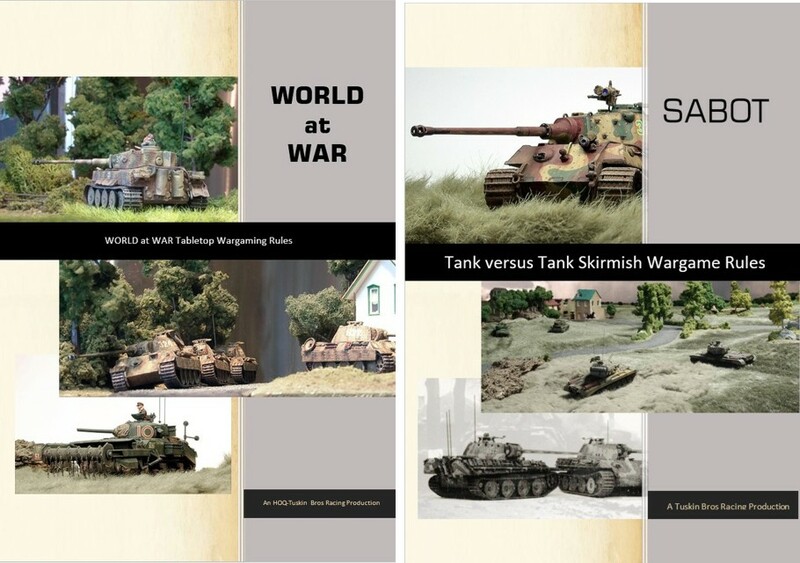 Sabot is our Tank vrs Tank tabletop RPG game. Again this is getting a dose of the new combat system and a focus on making the gameplay a little easier (some features were nice but needed tech to speed up the play which is beyond our resources) and with more focus on crew development and skills progression. We’ll probably convert Fire Team to the WW2 setting as well so allowing a man focused small WW2 skirmish game in the style of the Commando comics we loved so much. Just pure funsies here. We grew up playing Space Opera and Traveller and have a deep love of sci-fi. Upon hitting upon our new combat system it’s opened up Sci-fi gaming for us again as being able to be both simple but with depth, so it’s all ahead with the rules. The front end is done and allows any type of sci-fi troop type you can think of to be easily created with simple and relative stats. Races that can be created include from a few base values include Hordes (Tyranid, Alien and Arachnid types) creatures, Warrior races (think Klingons, Proxims and Krogans), Alphans, Human Planetary Forces, Heinlein inspired Power-Armoured Assault Troopers (gee I wonder were the idea for “space-marines and terminators came from”) and Robots. While not laser-locked on our Radar as being urgent, it’s hard not to feel the liberating freedom of being able to game anything you’ve ever read or watched in the Genre with one base system and not requiring to buy every specific rule set or kickstarter …. Survival Horror. Bit of a touchy one this one. It’s been on our “to game” list for almost 20years now so it’s definitely not a fad but we have had a couple of souring experiences that have pushed this back into the dark for a while. Long story short, imagine some naive kiwi lads (then part of another rules company) talking with a major gaming and miniatures company and their partnered publishing house about a rule set (none of their games or books had any “Z” related stuff in their published collections at that stage). After taking a copy of said rule set, offered in good faith of an agreed working relationship, but professing no real interest at all in that type of thing (“but we’ll see what marketing says”) it was exciting to see who ended up recently releasing a fully fledged Survival Horror game heavily using the rules concepts and systems my brother wrote most of – lesson, don’t trust big companies where profit, ideas and small developers are concerned. Tossers already had a line on procuring another manufactures “infected and survivors” miniatures we suspect, but didn’t have a rule set so were being total cynical cxxxs in pretending to have no interest. Either way producing this would be the second time we’ve re-written a Horror set but unfortunately now have most of our enthusiasm for the project sapped, so probably only the WW2 based set is ever likely to see the light of day fitted with the new combat system.